The wonderful Dame Helen Mirren is a L’Oréal beauty ambassador for the U.K. (Feel free to make her one for the U.S. as well, L’Oréal.) But when one of her ads was released for the brand, a complaint was filed claiming that she had been airbrushed. This is a #PRWin on many levels. First, for L’Oréal, there’s the satisfaction of being found innocent of trying to trick consumers. It’s a boost to the brand reputation and instills trust in the public, which is valuable. Second, it’s a win for Helen Mirren who is clearly so beautiful that people thought there had to be technological intervention to make her look this good. Women are scrutinized so closely for their looks. And in beauty and entertainment (and life), women over 30 are considered “older.” Dame Helen is 69 and fabulous. Queen for real. Finally, it’s a win for the brand, which gets the chance to say that the internationally-known celebrity that endorses its product looks incredible without the aid of Photoshop, but by using the product that she says she uses in its marketing. It’s a relationship that L’Oréal can push for maximum effect, fully confident that the marketing effort has stood up to close inspection. 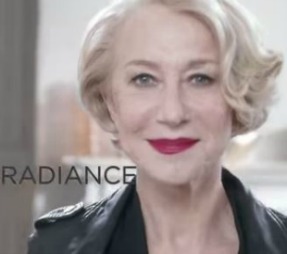 Helen Mirren is such a great choice as spokesperson for a beauty brand. She’s someone who has the respect of the entertainment industry, who’s clever in interviews and who audiences love. Moreover, women want to be as chic as she is at any age.